Weekend Kits Blog: Sewing Kits for Kids - Learn to Sew Crafts! Sewing Kits for Kids - Learn to Sew Crafts! Kids love learning & creating new things! Sewing is a creative craft for kids to learn as well as an essential life skill. We have a new selection of Sewing Kits for Kids from Colorbok to share with you today. These ready-to-sew kits make it easy & fun for young children to learn how to sew. You'll find them in the Kid's Craft Kits section of the store! The Velvet Fairy Build-A-Bear Kit is from Colorbok's new line of Make-And-Play sewing kits for kids. No need to find a Build-A-Bear Workshop in your area - now you can bring the Workshop right into your home! All the materials needed to complete the stuffed animal sewing project are contained in the kit. Even stuffing and a complete set of clothes! 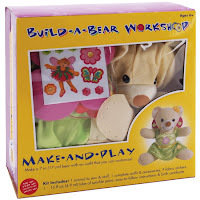 Kit includes a ready-to-sew 7-inch bear, stuffing, satin heart, embroidery floss, plastic needle, dress, set of fairy wings & elastic string, fabric flower, fabric stickers, tube of sparkle paint, easy-to-follow instructions, and birth certificate. 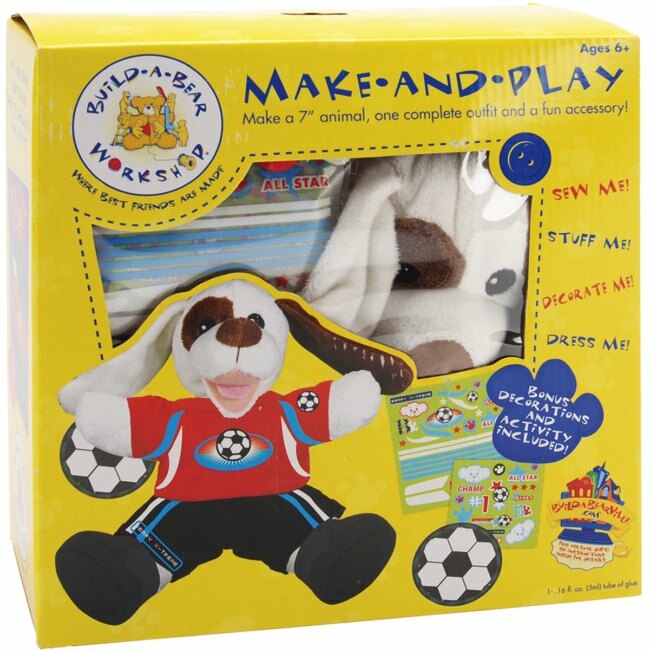 The Playful Puppy Sports Build-A-Bear Kit is an easy sewing kit for kids to make a soccer-themed plush puppy toy. The front and back pieces of the animal are sewn together using pre-punched holes and a plastic needle. Instructions describe the sewing assembly process. 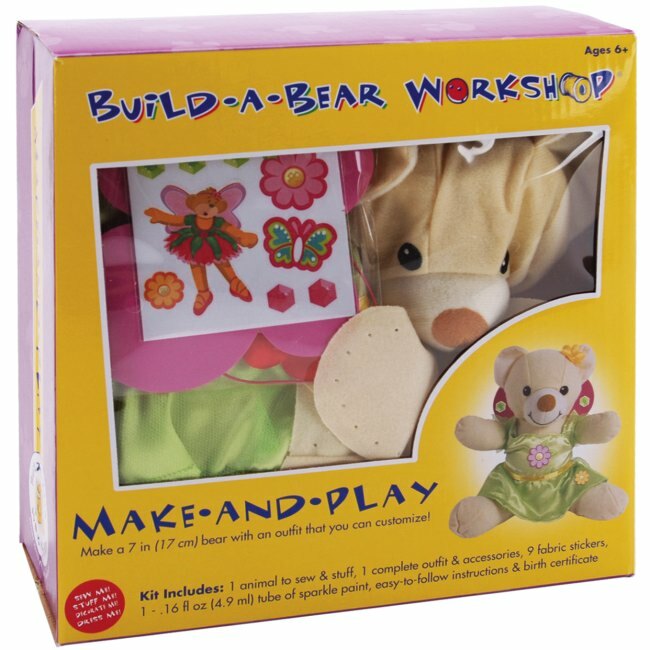 Kids will have fun as they follow the easy steps to sew, stuff, decorate and dress their new Build-A-Bear friend! 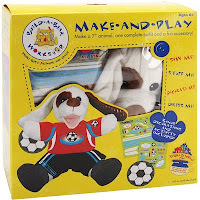 Kit includes a ready-to-sew 7-inch puppy, stuffing, satin heart, embroidery floss, plastic needle, shirt, shorts, shoes, iron-on transfer sheet, pop-out sheet, tube of glue, felt pieces, yarn, adhesive foam squares, instructions, and birth certificate. 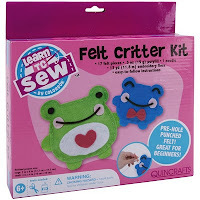 The Frog Felt Critter Kit is a learn-to-sew kit for kids to make two felt frogs. The larger frog is 7" x 6" and the smaller frog is 4" x 4". The felt pieces have pre-punched holes to help guide young children as they sew. This is an ideal sewing kit for beginners to learn basic sewing skills! 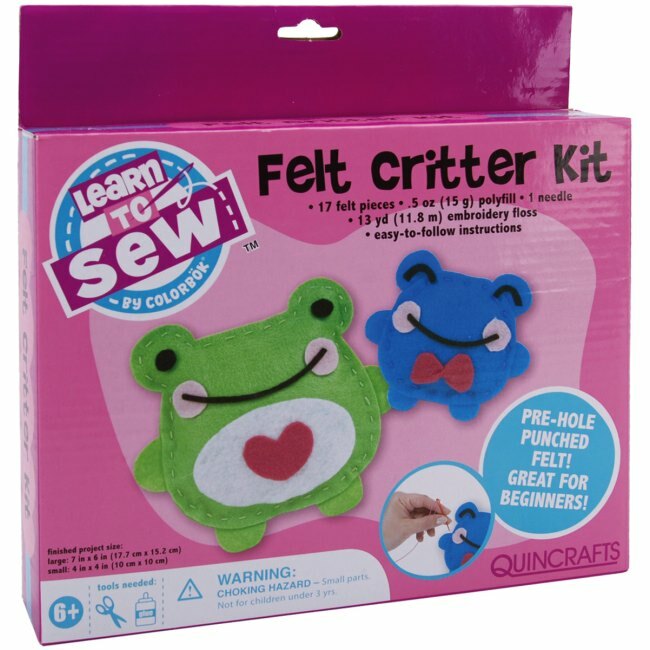 Kit includes felt pieces, poly-fill stuffing, plastic needle, embroidery floss, and easy-to-follow instructions. General craft supplies needed to complete the felt critter project include a pair of scissors & craft glue. Visit the Kid's Craft Kits section for details on these kits and to see our complete selection of craft activity kits for kids to learn a variety of creative skills, including sewing, knitting, weaving, embroidery, and more. Weekend Kits offers a great selection of Creative Craft Kits for kids and beginners of all ages. Stop by today and get the kids ready to learn a new craft on your next Weekend at Home! Creative Klutz Craft Kits - Great for Beginners! Learn to Quilt with Mini Quilt Kits - Easy & Fun!